I think my daughter and I were surprised by how much we actually enjoyed reading this book. 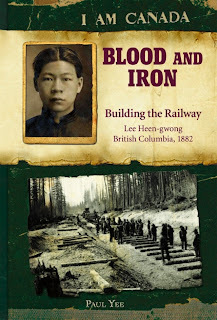 Written in the form of diary entries, Blood and Iron is a fictional account based on the translated journals of 14 year-old Lee Heen-gwong who came to British Colombia in 1882 to work on the Canadian Pacific Railway along with thousands of other Chinese workers and immigrants. 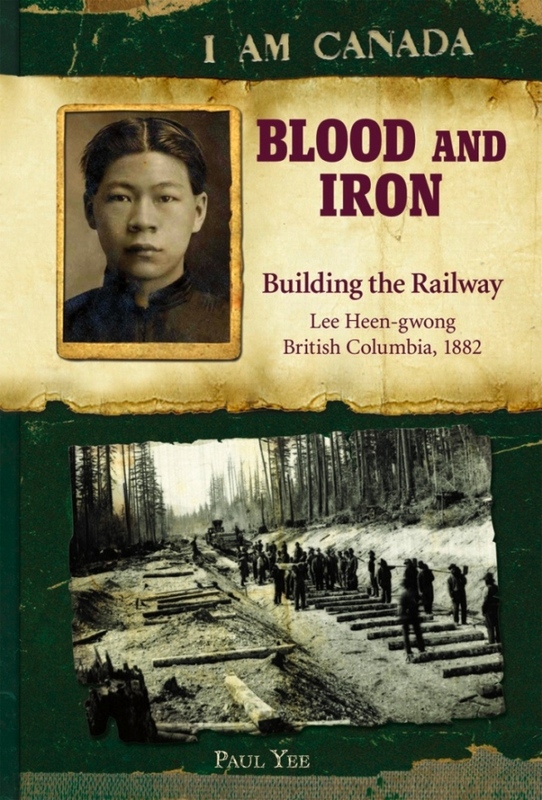 His first-hand perspective renders this account so interesting since not much has been recorded about the history of Chinese people in Canada. The Epilogue mentions that Heen’s great grand-son saved the journals from a stack of old business ledgers being tossed out. The story opens up in China just before Heen travels with his father Ba to work in America so that they can send money back to the family who is in dire straits because Grandfather gambled away their store. Initially, Heen is excited and his first journal entries are so funny, filled with his view of the world and his quirky expressions. All the characters are named according to their characteristics or work positions such as Big Lump, Thunder God, Tiger Face, Bookman and Short Boss. He refers to the Westerners as Red Beards. My daughter and I laughed so hard as Heen describes some of the adjustments and Chinese view of things. Soon, though, things get difficult as they are plunged into the dangerous back-breaking labour of cutting trees and moving earth and rock to build the railway. The details get gritty as Heen doesn’t mince words about the accidents and deaths that occur on the work site, the wretched living conditions, the lack of respect from the Red Beards and the injustices they face. We cringed at some of the accidents he witnessed. Heen also has troubles with his father who gambles and loses all their hard earned wages. Letters from his mother back in China reveal how their lack of income and presence is affecting the family. The themes are universal and teens today will be able to relate: a teen who yearns for his father’s approval, taking pride in one’s work, not wanting to be treated like a child. Heen feels keenly the desperate situation of his family and his despair is evident, but he is honest, hard-working and positive, gaining respect among the older ones. This is very much a story of survival. It isn't dull, but filled with action and the Chinese culture, customs and expressions. I have no doubt this new I Am Canada series from the creators of the Dear Canada series will also be popular, especially among boys, the target audience. For even my sensitive tween girl enjoyed it immensely as we read it together. This book will be on my Christmas list. Thanks for the review. It's it great when a book is even more enjoyable than you thought? I've never read an "I Am Canada" book and I'm not much of a Middle Grade book reader but this does sound interesting. Thanks for the review.